Classes at AK9C | Can I Bring the Dog? 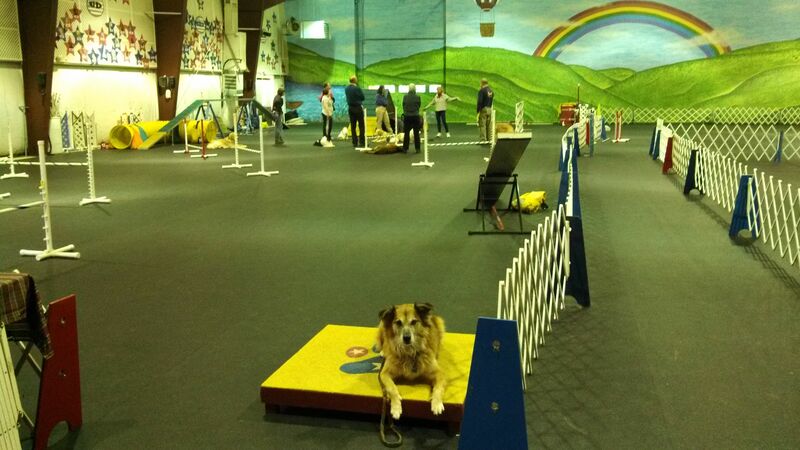 This week and last, just to mix it up, I took Chico to Julie’s Wednesday classes at American K9 Country. We’ve competed in trials here, and when I was away in the fall, Chico came almost every week with Julie, but we haven’t done classes together, and that made everything new. The first day, Chico started out by standing and barking at all the other dogs in class. It took putting him on-leash and leaving the ring for a moment before he settled down. That’s also why this particular down-stay-with-distractions has the distractions so far away. The second time we went, it was a different group, and we each had a chance to run a couple courses, one at a time. That went well, but when my group and the group from the next class all came in the ring at the same time to do an exercise where we each took a jump and practiced sending to the back side of it, Chico just fell apart again. He was very concerned about the dogs working near us, he couldn’t concentrate on me, he wanted to watch the other dogs. And bark at them. But why? To make sure they left us alone? To make sure they were not going to crash into him? Because he decided to be a jerk? To my eye, he looked more nervous than angry, but I still only get about a B- in reading dog body language. I didn’t have time to ask because our class was long over by the time Chico could actually practice the maneuver and I felt lucky to have the floor space and the time. I’ll get the answer. This entry was posted in Uncategorized and tagged American K9Country, dog agility, Julie Daniels. Bookmark the permalink.